Waldorf wrote: Posting feedback here would be great. Small note, this proxy support is for Tracker communication only. Doing so for the p2p communication would be madness (or so I've heard). Errr..... I was under the obviously mistaken impression that tracker communication was p2p communication...? Does this mean we shouldn't use this option to connect to a p2p proxy like relaxxs or something, because from what I gathered from the other comments, that is what people are wanting it for. steveio, Just to be clear: Relakks (not relaxxs) is a VPN service. This is completely different thing then a proxy. p2p = peer to peer. Tracker <-> peer communication is just plain server <-> client communication. The tracker isn't a peer, or node, in the swarm (notable exception is DHT). Thats not to say that it isn't part of the p2p Bittorrent protocol. The proxy support allows you to relay Tracker communication so that you'd stil be-able to connect, even if your ISP blocks the tracker. To mask your p2p communication, there is peer encryption. In r6262 SOCKS5 seems to work at least. Don't see any problems in the Debug log or under the torrent's Activity tab. One suggestion: I'm using the Linux/GTK+ UI, and I think you should add another field in the Network tab under Tracker Proxy for entering the proxy port. Requiring the user to specify the port in the Proxy server field in the format 127.0.0.1:9050 will probably throw some people off because it's not very intuitive. I agree with potatofiend, but my vote is for the mac client. It would be very helpful to have peer communication through the proxy as an option. Some of us need to use proxies for all our communication (my example is tunnelling through an iPhone or other tethered device). Also, providing proxy support of peer communication would allow people to SSH tunnel to a machine that accepts incoming connections if their localhost cannot (for whatever reason). It's not a great idea for maximum performance, but it's necessary for some network configurations. I downloaded this to try the SOCKS support with SSH tunnelling in an attempt to speed my dog slow download/upload speeds, having not read the bit about SOCKS being only for the trackers. Anyways, I haven't tried the SOCKS bit yet, but has anything been done to improve the performance of Transmission in general ? I've checked the stats for the torrents involved (peers, seeds, leechers) and there is little or no difference in them, so unless the seeders have suddenly become more magnanimous overnight, the difference must be due to the build ? The port indicator is now working properly as well, with both the manual and UPnP configuration. WELL DONE GUYS ! (Whatever you've done). Hi, does this mean, that Transmission supports btguard.com SOCKS V5 proxy or not? I was under the impression that when using a VPN service such as Hotspotshield etc. that all internet traffic was directed via the VPN providers remote server. Is this correct or not correct? If in fact this is correct, would it therefore be correct to say that the only IP address shared with both trackers and peers would be that of the VPN providers server. Any news about the peer communications SOCKS proxy support? It'd be useful to have all torrent traffic look as if it's coming from my SSH server. uTorrent (the Windows version) has an option for that. jackmaninov wrote: It would be very helpful to have peer communication through the proxy as an option. Some of us need to use proxies for all our communication (my example is tunnelling through an iPhone or other tethered device). Also, providing proxy support of peer communication would allow people to SSH tunnel to a machine that accepts incoming connections if their localhost cannot (for whatever reason). Indeed. I am forced to connect to the internet through a proxy (HTTP or SOCKS). Do we have any status updates on this feature's implementation? I know other BT client support this, but I just like transmission way too much to let go. one option to funnel ALL traffic from the application through a proxy would be to simply use tsocks. however, upon trying to load transmission through tsocks on OS X, it bombs every time. 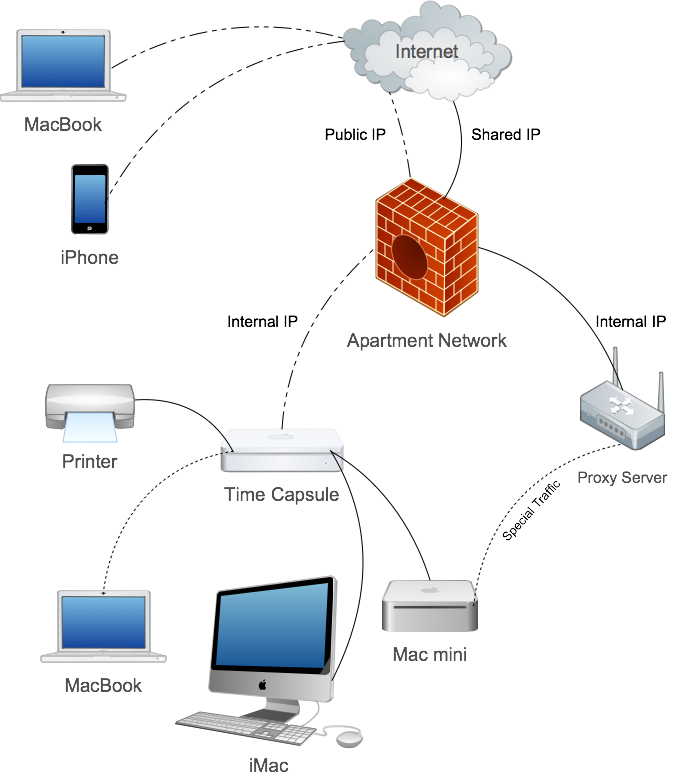 my network setup at my apartment is kinda stupid and complex at the same time. I have to run transmission through a proxy to prevent it from leaching bandwidth off of my primary connection. here is a relatively simple diagram of how i need my network setup. the only missing key right now is transmission's ability to tunnel all traffic through a proxy. once this is implemented, i can deploy this configuration. i'm in no rush though, i understand how the open source development process goes. so please don't think i;m asking you all to quit your day jobs or anything for this. i am a computer science student, so i may be able to lend a hand. i am going to start looking through the source to see where we can add this support option to implement the proxy libraries into transmission. So I was using uTor under WINE to run the fantastic windows uTor client, which supports running ALL data through a HTTPS or SOCKs proxy. I got great speeds and it was not too bad of a setup; however, I had to start the SSH tunnel, then start wine, which boots X11, then uTor would come up. So when a stable uTor Mac client came out, I wanted to use it, but it doesn't support proxies. After endless searching to try and setup a sandbox or specific pipe for a single process's data to be routed through, I found Proxifier. You can select a certain program's network data to be run through your proxy, without slowing everything down. Again, this worked great. A little easier to setup, but still several steps to getting the program running (ssh tunnel, Proxifier, uTor mac). When I saw that Transmission had proxy support, I just about jumped out of my chair. Then I of course realized the reality of tracker data only proxying; this client is amazing, I'm going to use it over the uTor mac client, but I as well would like to run all data through a tunnel. I am behind a network that examines data, and if they find any string related to a movie or current TV show, they swoop in and identify the data. I run everything sensitive through a SSH tunnel; i.e. the "encryption" is not enough, even if you forced encrypted peers. So in the end, I would love to see this feature, but to all the rest of you, check out Proxifier and just send you torrent data through your SOCKs 4, 5 or HTTPS. Another vote to transmission proxy support !!! !